In a Nutshell: Launched in 2015, Hydaway Bottle was created as a hassle-free alternative for travelers who were frequently buying water bottles in airports only to toss them out before boarding the plane. The no-leak bottle collapses to fit comfortably in pockets making it useful for any number of situations beyond traveling, including going to the gym or packing into a diaper bag. A valuable benefit of the Hydaway Bottle is that it helps reduce the number of single-use plastic bottles going into the waste stream. The company is continually improving the product and bringing more options to customers, including a carbon filter, regular or spout lid, and carrying case. As a freelance designer dealing with international clients, Niki Singlaub was frequently on the go and enduring the inconveniences that come while traveling. But one that stood out for Singlaub was the issue of staying hydrated. He generally found himself in one of two scenarios and neither option was ideal. Singlaub would buy single-use water bottles in the airport and toss them in the garbage before boarding the plane, often wasting water as well. Or he would use his own bulky reusable bottles that took up valuable space in his luggage. Then Singlaub came up with the idea for Hydaway Bottle, a collapsible, no-leak water bottle that becomes small enough to fit in a pocket when not in use. After a successful crowdfunding campaign, Singlaub’s idea became reality in 2015. We know many of our readers travel frequently thanks to cashing in air miles from their favorite travel cards, and we often like to help them quench their thirst for information on related travel products. So, we sat down with Hydaway Bottle’s Marketing Director, Chris Hanson to learn more about the company’s story and the benefits of using Hydaway Bottle. Hanson said the bottle’s compact design works well for parents who are often juggling supplies for their kids, whether they’re going on a trip or just running errands. Parents can throw the collapsed bottle into their pack and use the extra space for other essentials like snacks or diapers. The Hydaway Bottle collapses to approximately 1.5 inches high for easy stowing during travel. Additionally, he said saving space in a gym bag is a valuable application. With towels, tennis shoes, a change of clothes, and other accessories, carrying a bulky water bottle around can be heavy and annoying. Hanson said the company takes a lighthearted approach to marketing the product and wants it to be perceived as not only a very functional product but a fun gadget as well that can reflect the owner’s personality. The bottles come in a wide variety of colors from black and grey to bright yellow and aqua blue. The Hydaway Bottle works like an accordion. When it is collapsed, the bottle is only 40 mm or about 1.5 inches tall, and it expands to hold 18 ounces of liquid. 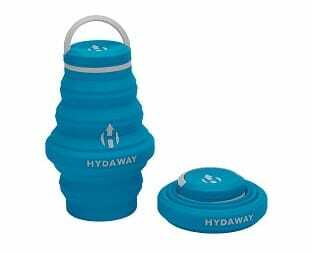 Hydaway Bottle also has a carrying case available for purchase to help keep the dishwasher-safe bottles clean on the go. Hanson said that while Hydaway Bottle takes a lighthearted approach to its designs and marketing, the company is very serious about the environment. Hydaway Bottle partnered with no2plastic.org to help raise awareness of the impacts of single-use plastics. He said the non-biodegradable garbage mass floating in the middle of the Pacific Ocean is now more than double the size of Texas. And microplastics — tiny particles that are ingested by fish and humans alike — are a growing concern as well. “One prediction from The Washington Post that really stood out to me was that pound for pound, plastics are expected to outweigh fish in the ocean by 2050,” Hanson said. The developers of Hydaway Bottle saw how they can help address these issues by trying to make a dent in the amount of single-use plastics being used by consumers. Hanson said the company is pragmatic and realizes that it’s not going to change the world single-handedly but it hopes to make a contribution to a better future and hopefully change the mindsets of some consumers. The Hydaway Bottle is made almost entirely of food-grade silicone but Hanson said the bottle has some small, BPA-free plastic components the company has not yet been able to eliminate. It continues to evaluate how to make it better. Based on sales figures, the company estimates Hydaway Bottle has helped eliminate 1,100 metric tons of plastic waste. 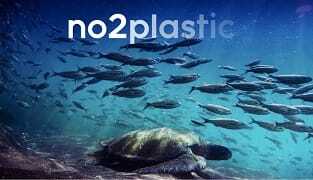 The company has also partnered with the nonprofit, no2plastic.org, whose mission is to reduce the use of single-use plastics worldwide. Hydaway Bottle offers a limited edition of no2plastic-branded products, and a portion of the proceeds go to the nonprofit. 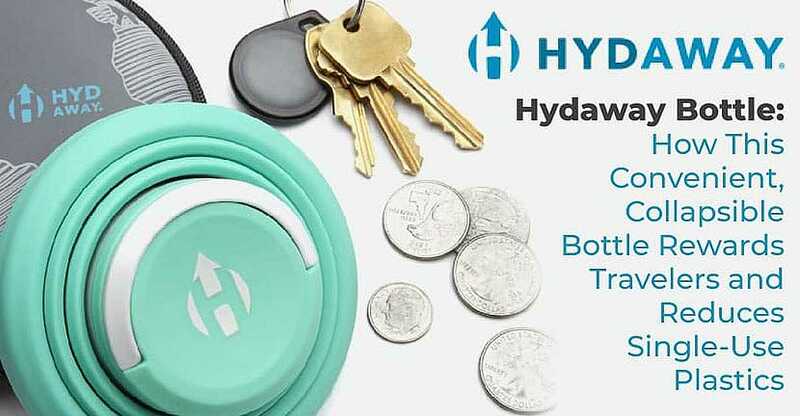 Hydaway Bottle recently launched its second round of products, which Hanson said improves on the original design in a number of ways. “We were able to make it lighter weight and eliminate some of the plastic that was in the original version, which ties back into our mission as well,” he said. Hanson highlighted a number of other improvements as well, including a carry handle that completely stows away when the bottle isn’t in use and a re-designed spout lid that pops up more easily and has a higher flow. The Hydaway Bottle comes in a wide variety of colors. In addition to the spout lid, Hydaway Bottle also offers the option of a simple screw cap lid, for those who prefer not to use a spout. Hanson said the company was able to tackle another travel-related inconvenience with its refreshed product line. Hanson said the small carbon filters fit conveniently in the compatible lids and the bottle can be collapsed with the filter in place. He said the filters work to eliminate chlorine flavors and give water a more refreshing taste, but the company cautions the filters are not intended for hikers and campers. The filters do not filter out bacteria or viruses that may be found in rivers and streams. With the holiday season upon us, and a lot of people who probably already have travel plans lined up, Hanson pointed out that the Hydaway Bottle and its accessories make for a great present. Hydaway Bottle helps make traveling just a little bit easier with its compact design, while users can feel good knowing they are keeping plastic out of the waste stream. Hanson said the company is always listening and responding to customer feedback to improve the product. 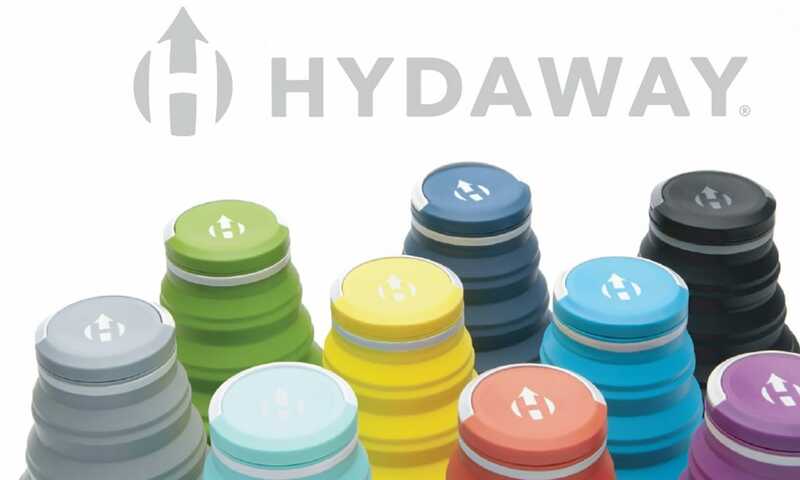 In the new year, Hydaway Bottle will have more options available as the company adds new sizes to its lineup. For the latest news and information, visit the company website or its Kickstarter page.